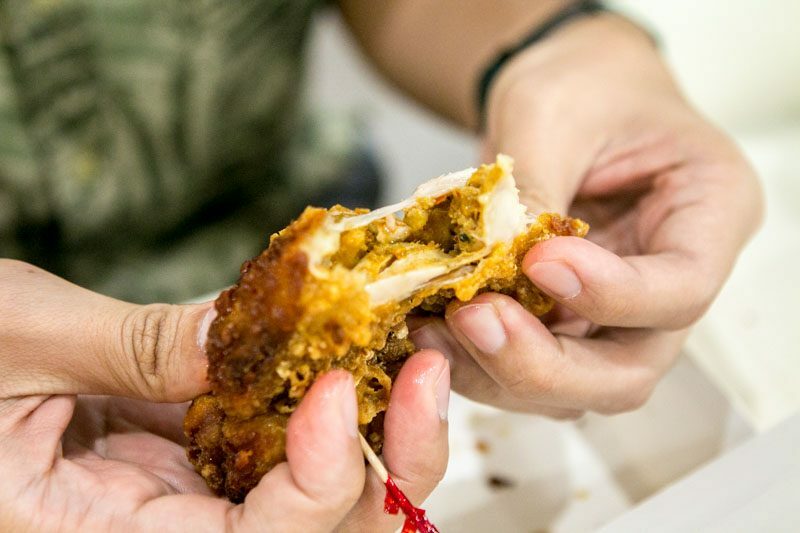 Fried chicken lovers, a new favourite has emerged. 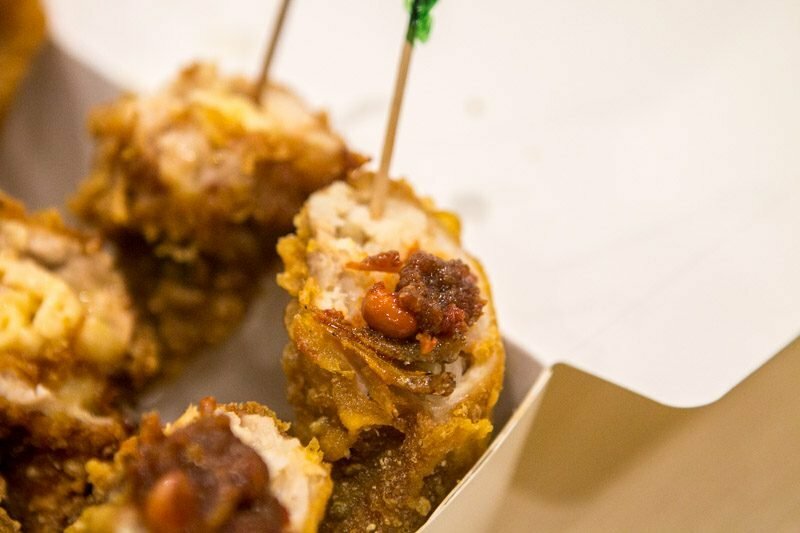 When we first heard about StuffedWing, I was rather dubious of its legitimacy as a trending eat — fried chicken wings stuffed with nasi lemak? With Mac N’ Cheese? Whuttt? With its ease of accessibility at Tampines Mall’s Kopitiam, the affordable price point is a win as well. 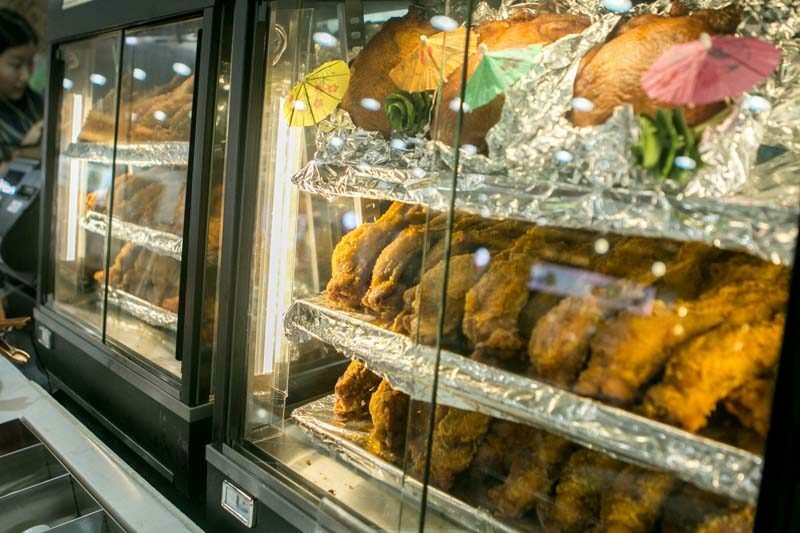 Seeing rows of golden crisp chicken really does get your appetite going, but heads up as the ones on display are only cooked till about 80% done. 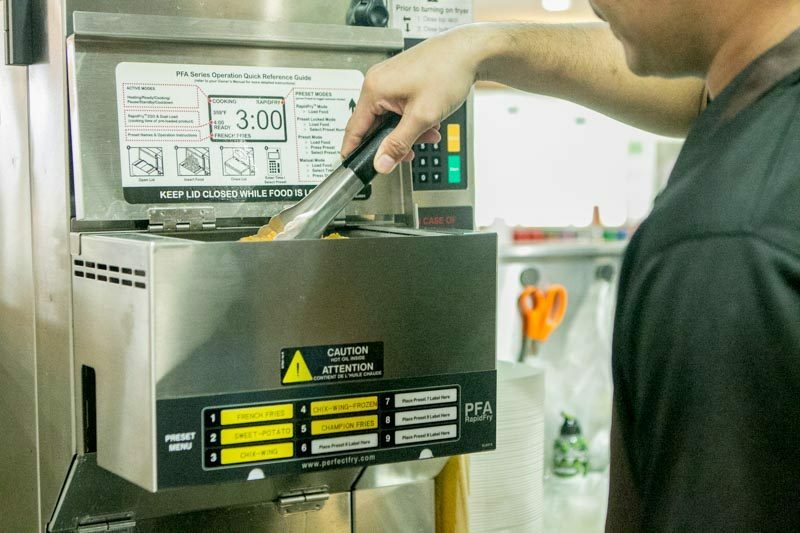 Once you place an order, they’ll deep-fry the wings in a machine that’s set to a specified timing and temperature so that the fried chicken turns out hot, crunchy and ready to eat. Currently, they have five different types of stuffed wings, with four options of fries sides. Starting off with the Signature Nasi Lemak (S$3.80), I must say, the rice was lacking in the familiar coconut milk aroma and taste, but the sambal was really quite impressive. It was especially savoury, with a hint of sweetness, and even had a bold enough spicy kick to really turn the heat up. The chicken flesh itself was tender and juicy, while the skin was crisp and not overly greasy. Another interesting option is the Signature Mac N’ Cheese (S$3.80). I’m actually glad the mac n’ cheese filling itself wasn’t gooey and viscous, because it would’ve proved to be too much with the deep-fried batter. However, taste-wise, this impressed me the least, meaning that it could’ve done with more seasoning and spices. My favourite was the Signature Nonya Curry (S$3.80). 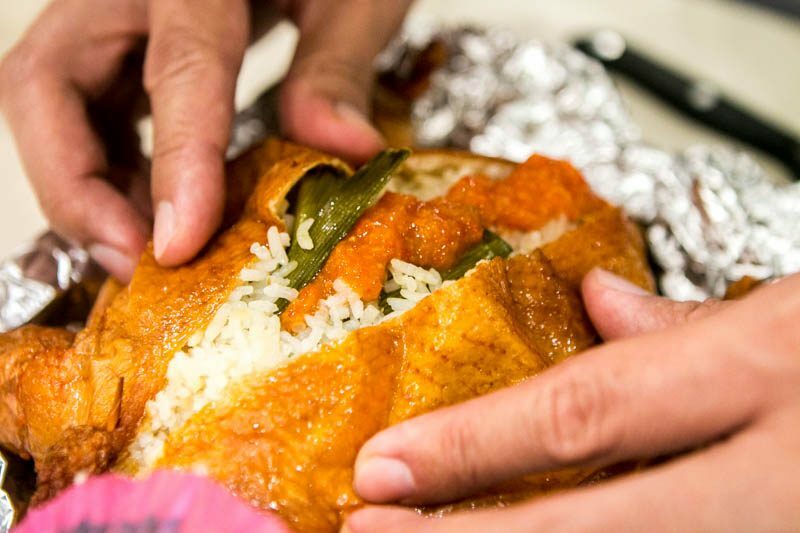 It tasted very similar to taking a huge bite out of a curry puff that’s brimming with flavours. The use of a chicken wing as its vehicle was nothing short of genius, because it meant I could enjoy it with more protein! There’s also the Signature Salted Egg Yolk Prawn (S$3.80), which I felt was really passé. 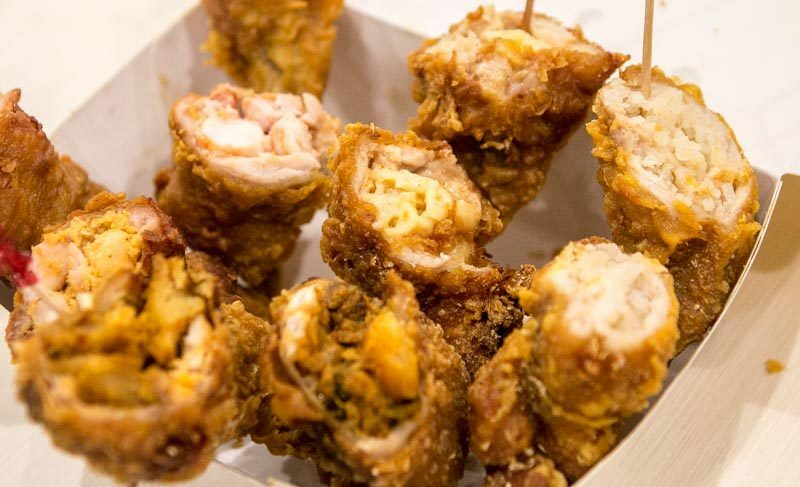 The salted egg yolk hype has seen better days, and I think it’s time a lot more places moved on from trying to bank on its (now-defunct) appeal. Having said that, this version of the famous salted egg yolk flavour failed to make a lasting impression on me. It had a slightly powdery consistency, and the taste itself wasn’t very powerful. 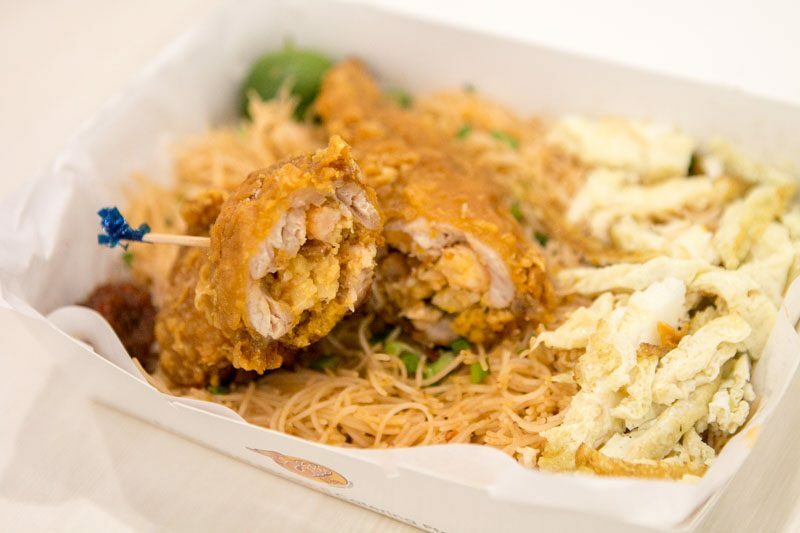 They also serve a special set, Sedap Gourmet Sambal Fried Dried Mee Siam (S$5.90) that comes with a wing of your choice. While the dry mee siam itself was quite mediocre, the sambal was what made this dish work. Its spiciness really compensated for the lack of excitement that the dried mee siam failed to deliver. Need sides? StuffedWing have got you covered! 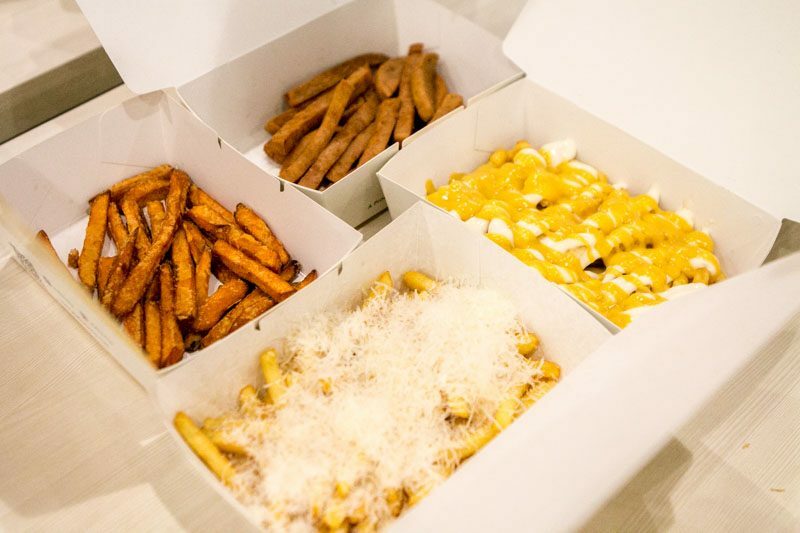 Out of all four, I would say, the Regular Cheesy Fries and Regular Sweet Potato Fries (S$3.50 each) would be your best bets. Why? The homemade mayonnaise in the Regular Cheesy Fries is infused with chicken stock, so it’s not just creamy, but also surprisingly savoury and honestly, really delicious (that means a lot coming from someone who dislikes mayonnaise). The Regular Sweet Potato Fries, on the other hand, is a biased pick, because I do enjoy sweet potato any way I can get it! 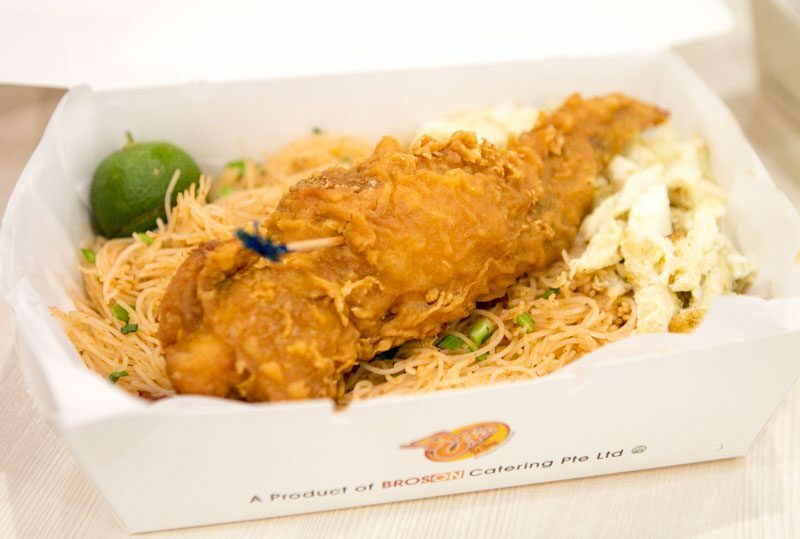 The highlight of my afternoon, however, was their latest offering, Boneless Spring Hainanese Chick (S$19.90). 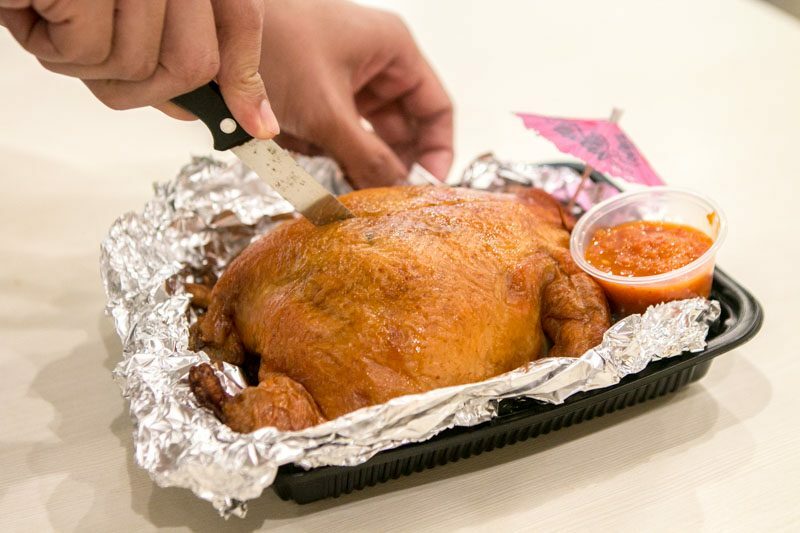 It’s an entire spring chicken that’s been de-boned, and filled to the seams with fragrant Hainanese Chicken Rice. I actually couldn’t believe it when it was cut open, because I expected some resistance when splitting the chicken open. 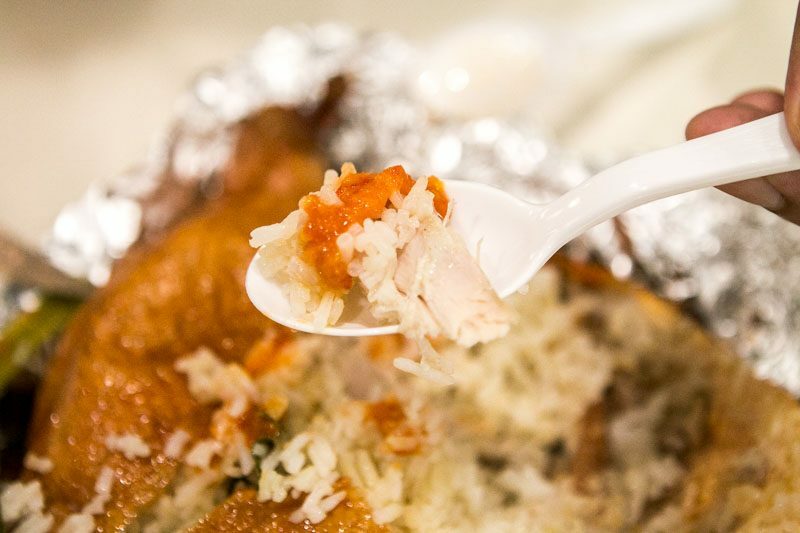 Instead, the roasted bird was incredibly soft and exposed fluffy and aromatic chicken rice. Given that the rice is cooked together with the entire chicken, the flavours were phenomenal; I could say this was one of the best Hainanese chicken rice dishes I’ve enjoyed. The portion, I feel, is great for three to four people. The chilli was fantastic; really bright, tangy and spicy. I would 100% order this again if there’s ever an occasion for it. 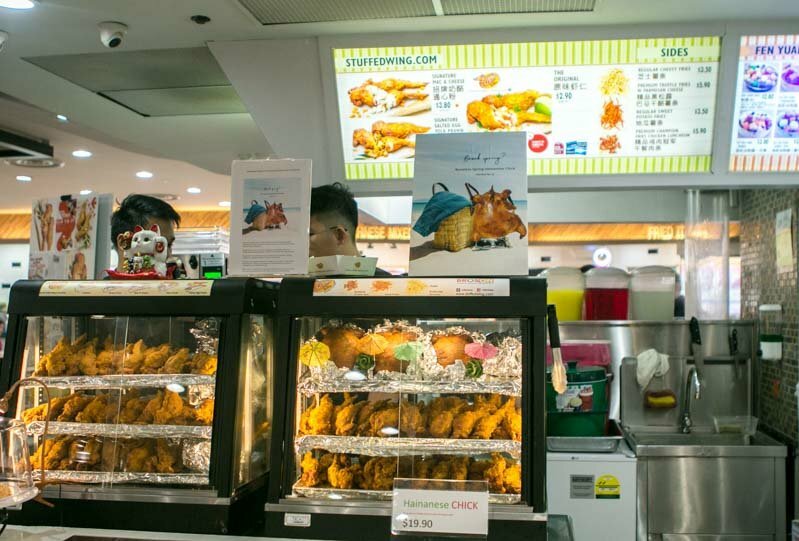 Despite it being located across the island for me, StuffedWing has got me wishing it would open another outlet in the West soon. 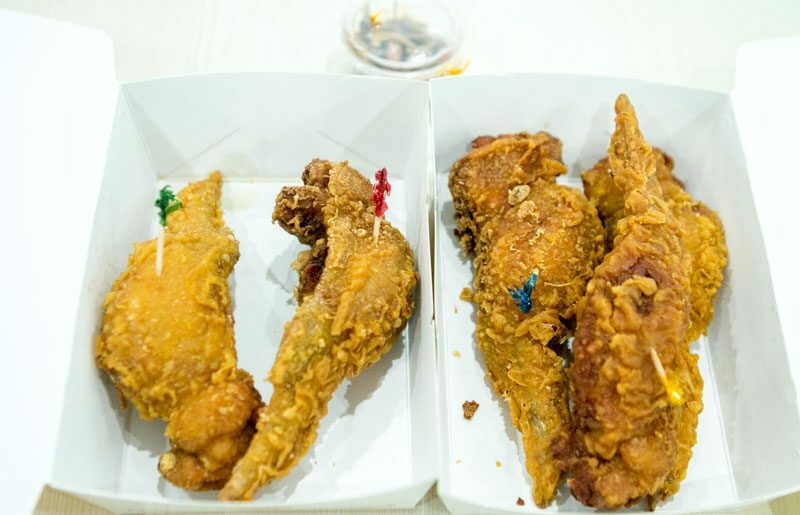 It’s fried chicken wings aren’t a total win, but its version of Hainanese chicken rice is something I’m sure I’m going to have cravings for.